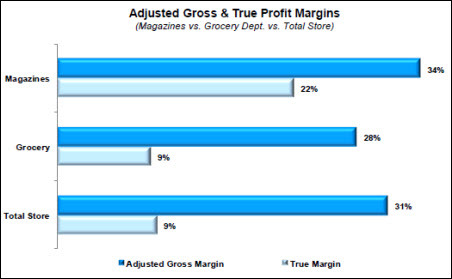 As in all past Willard Bishop Grocery SuperStudies, the 2014 research confirms that the magazine category continues to be highly profitable for grocery retailers. This is true across the key metrics, and in comparison to both the total store and competitive categories. The SuperStudy uses retailer sales data and activity-based costs (ABC) throughout grocery stores to assess the profitability of all categories and departments. The 2014 report is based on analysis of POS and other data from four typical stores in each of three chains: Kroger, Safeway and Ahold. Each retailer provided 52 weeks of data (ending either in August or September 2014) from its stores. The results are composite averages of the retailers' data. IPDA has been among the sponsoring members of the study since 2007. On average, magazines in center store generate $439 in weekly true profit. For context, among center-store GM categories studied, gift cards have the highest weekly true profit, at $1,391, and diapers have the lowest, at negative $384. Across all center-store categories studied, the highest performer is dairy ($4,213) and the lowest performer is carbonated beverages (negative $968). Those metrics significantly outpace other categories with which magazines compete for space, including the other major front-end categories of carbonated beverages, candy, salty snacks and meat snacks. The study documents several factors contributing to the healthy magazine profits. These start with a strong margin going in. But a high average price per unit, low labor costs resulting from magazines' direct store delivery (DSD) model, near-zero retailer inventory costs as a result of scan-based trading (SBT), and productive space are the main factors driving magazines' strong bottom-line profitability. Further, with little to no retailer capital investment due to the category's SBT status, magazines' return on investment is pure profit. The category's AGM true profit return-on-inventory-investment (AGMROII) and true profit return-on-inventory-investment average $2,822.31 and $1,839.78 per week, respectively, according to the SuperStudy. In short, the category's unique attributes and supply chain work to the retailer’s advantage, allowing an unusually high percentage of profits to flow through to the bottom line. Among 38 general merchandise (GM) categories, magazines rank fourth in true profit, 13th in weekly sales, and 23rd in category movement per facing. Looking at the big picture, magazines rank higher than 76% and 75% of categories in center store and total store, respectively, in weekly true profit. "Magazines' high profitability reflects the negligible labor costs associated with their DSD distribution model, combined with SBT agreements that mean no inventory costs and no risk for retailers," observes Jackie Gray, director at Willard Bishop. "The category's turns aren't as high as some with lower price points, but it's delivering outstanding bang for the buck on every turn," Gray continues. "And at the front end—where retailers are, of course, focused on maximizing profit on every inch of impulse space—magazines deliver the highest per-unit profit when compared to candy, single-serve carbonated beverages, and salty and meat snacks." Gray adds that in addition to profit and sales metrics, retailers are looking to make shopping trips engaging experiences and build loyalty, so how customers respond to a category has never been more important. On that score, she points to separate Willard Bishop research from 2014 showing that supermarket shoppers who purchase magazines are exceptionally loyal and valuable customers. "They shop more frequently than non-magazine-buying shoppers, they shop the whole store, and they represent a significant 32% of the average store's sales," she says. "They buy an average of six more units per basket than other shoppers, and generate an average basket ring of $45, versus $34 for other shoppers." Keeping already highly loyal customers happy while striving to increase loyalty among the rest of the customer base is extremely important, she points out.